A Fort Worth man landed in the clink after a basketball shoe swap gone wrong. Now he’s fighting to save his reputation. Cover illustration by Louis Dixon. Trading his four pairs of Air Jordan sneakers for one pair of Yeezys sounded like a fair deal to Ryan Perez. The Jordans were fairly common, selling for around $250 to $350 each on the aftermarket. 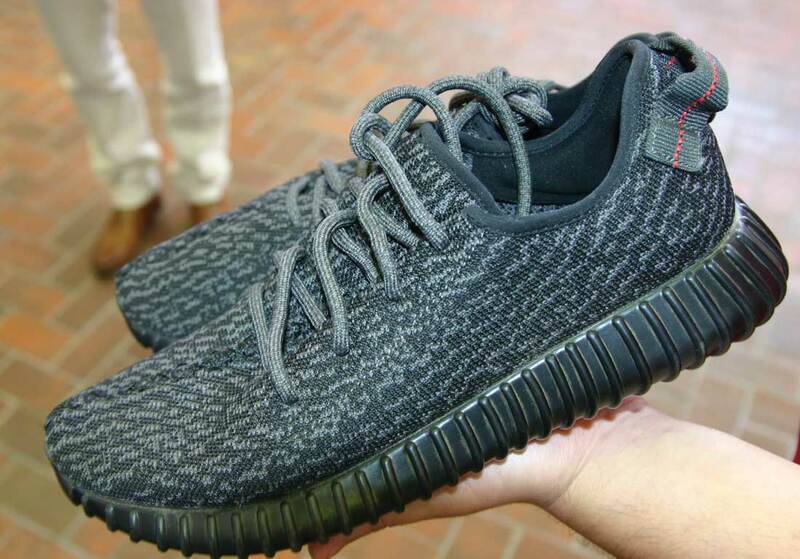 The Yeezy Boost 350s, made by Adidas and endorsed by rap star Kanye West, can sell for more than $1,000. Perez was so proud of his newly acquired Yeezys that he posted a photo online. His pride turned to disappointment after fellow sneaker enthusiasts commented that his Yeezys looked like fakes — “Feezys” as they are called. Genuine Yeezys are rather unspectacular, with grayish black canvas tops and black soles. But the threading on the canvas and heel tabs is unique and not easily replicated, as well as the sophisticated insoles. Perez then saw that the guy with whom he had traded shoes –– Davis Dorries –– was online and apparently bragging about swapping counterfeit Yeezys in exchange for the Air Jordans. “Are they really fake?” someone with the name Davion replied. A friend of Perez happened to be on that private site and sent an invitation to Perez, who surfed there and grabbed screenshots of the conversation before the comments were subsequently removed. 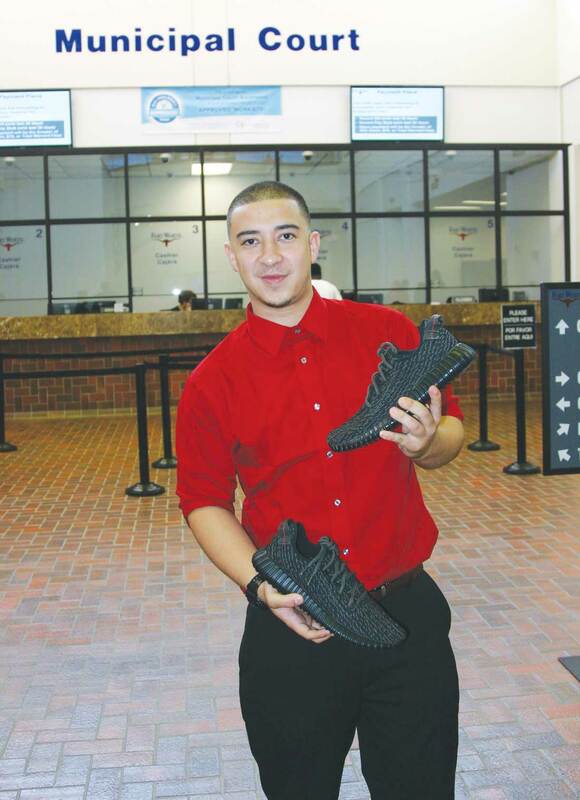 Ryan Perez holds the fake Yeezys after being awarded all of the sneakers in a property hearing. The 23-year-old Perez would eventually have his Air Jordans returned to him but only after confronting Dorries in a parking lot. But Dorries, an 18-year-old Roanoke resident, accused Perez of robbery. 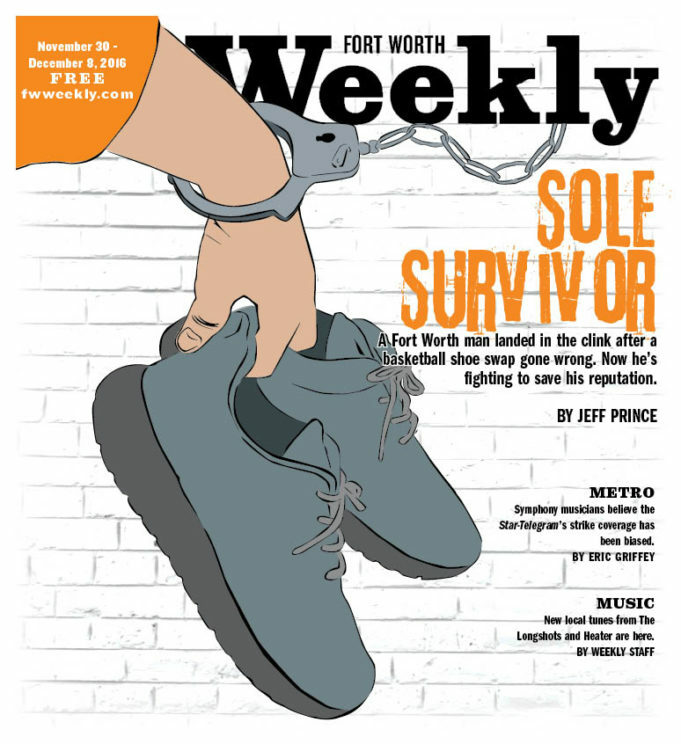 Fort Worth police issued a felony warrant on Perez, setting off a string of incidents that would lead to Perez’s being arrested, handcuffed, jailed, kicked out of his apartment, dumped by his fiancé, and spending thousands of dollars on attorney fees. Perez’s mother, Mary Perez, suspects that additional factors played into her son’s arrest. Dorries is white. Ryan Perez is Hispanic. Mary finds it odd that a white kid can call police to accuse a Hispanic man of robbery, prompting police to issue a felony warrant without making any attempt to get the Hispanic’s side of the story. 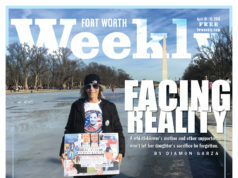 Also, Mary has clashed with Fort Worth police in the past – particularly with Deputy Chief Charlie Ramirez – over what she perceives as heavy-handed treatment of Hispanics in recent cases on the North Side. Last year, she accused Ramirez of threatening to blackball her restaurant, Enchiladas Ole, after she held a community meeting there to discuss the involvement of Fort Worth police in two separate shootings of young Hispanic men on the North Side. She also solicited media attention after Fort Worth police burst into the home of Jesse Urias against his will. Urias is a mentally challenged man living alone and relying on the help of neighbors. Police went to his home to serve a warrant on someone who did not live at that address and someone Urias did not know. Police, however, forced their way into his house, breaking his door jamb and frightening him in the process (“Piling on Trouble,” March 4, 2015). At the community meeting at Enchiladas Ole, Mary and Ramirez got into a heated exchange after she accused police of trying to intimidate her because of her activism. She said a police officer in a patrol car tailgated her vehicle as she was driving home after work around that time. Ramirez, speaking to everyone in the crowd, denied that police would do such a thing to Mary. Mary wonders if that bad blood is spilling over to her family members. The police “probably had it in for me and took it out on Ryan,” she said. 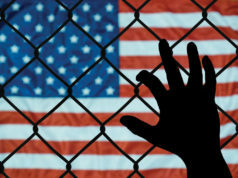 Mary had called Ramirez shortly after her son’s arrest, telling the deputy chief that Dorries was online bragging about trading fake sneakers with her son. Ramirez brushed off her claims, she said, and seemed determined to see her son prosecuted. Ramirez did not respond to interview requests for this article. A police spokesperson said the deputy chief was out on medical leave and unavailable. Local news media reported on the sneaker deal gone bad, mostly because of Mary’s relentless push for exposure. The owner of the Riverside area Mexican restaurant is an energetic, impassioned force of nature with a knack for getting media attention when she wants to right something that she considers to be wrong. News media and online bloggers reported on the sneaker incident but with little depth. None of the reports mentions accusations of a botched or compromised police investigation. In June, the Dorries-Perez case was closed after a Tarrant County grand jury refused to indict Perez on a robbery charge. The following month, a municipal court judge oversaw a property hearing to determine whether Dorries or Perez were the rightful owners of the sneakers involved in the trade. I attended the hearing, hoping to get a chance to talk to Dorries and hear his side of the story through testimony or a private interview. But Dorries never showed up. The judge awarded all of the sneakers, including the Yeezys, to Perez. I was unable to contact Dorries at all. The cell phone number he provided to police is no longer working. He has removed the Facebook and Twitter pages he had been using. I found another Twitter page that Dorries had created and sent him a message requesting an interview. I did not get a response. I mailed a letter to Dorries’ home address in Roanoke asking for an interview but did not get a reply. I did not make the 64-mile round-trip drive to Roanoke to knock on Dorries’ door since he had not responded to my previous inquiries. Perez wants police to charge Dorries for fraud and for filing a false police report. Perez, however, said police detectives have shown no interest in filing a police report based on his complaints against Dorries. A detective told me the same thing. The lure of sneaker trading kind of crept up on Ryan Perez when he was about 9 or 10. In the early 2000s, his mother was director at the Northside Boys & Girls Club, where Perez played a lot of basketball. He noticed how some of the older boys seemed to always be wearing a new or different pair of sneakers. One day, a couple of the older boys joked about how Perez wore the same pair of basic off-the-shelf sneakers every day. There is a great big world of basketball footwear out there, they told him. Perez listened to them describe how Nike was making numbered versions of top-shelf Air Jordans, fancier versions of the basic Air Jordans endorsed by basketball great Michael Jordan and made by Nike beginning in the mid 1980s. The older boys were buying shoes, wearing them a time or two, and then swapping them to someone else for a different pair. “I started talking to these guys more and more about shoes,” Perez said. The older boys described how they would stand in line at malls to buy limited edition Air Jordan sneakers and then re-sell them for a profit. In 2001, a 12-year-old Perez made the transition from sneaker fan to entrepreneur. He and a friend convinced the friend’s mom to take them to Northeast Mall so they could stand in line for the release of the Air Jordan III, the first Jordans to feature a visible air unit on the heel. The shoes were selling for $196 after tax. Perez owned about a dozen athletic jerseys that his mother had purchased for him over the years, and he sold four of them at $50 a pop to come up with $200. He made sure not to tell his mom. Perez and his friend stood in line for three hours only to discover that the store didn’t have the shoes in stock. But the customers were told that Champs – a store on the other side of the mall – did have the shoes. Perez got his shoes, a pair of green and white beauties. He fetched them out of the garage several months later on St. Patrick’s Day, since the sneakers were green, and he showed some friends. For that one pair of Jordan IIIs, Perez received two pairs of Jordan Raptors and a pair of Nike Air Force 1s. He traded a pair of Raptors for two more pairs of sneakers and ended up with five pairs of shoes in exchange for one. It didn’t take long for his mom to notice. “She started asking where I was getting these shoes from,” he said. She liked his entrepreneurial spirit and allowed him to continue his hobby as long as he did it safely and legally. After graduating from high school, Perez and his girlfriend moved to San Marcos. She was studying criminal justice at college while he managed an Adidas athletic shoe store. He hoped to climb the company ladder and become an area manager or district manager one day. “That was my dream, to stay at Adidas,” he said. But his mother asked him to return to Fort Worth in 2013 to help run her new restaurant. “I moved back here and brought all my shoes with me,” Perez said. Like many other enthusiasts, he bought, sold, and traded sneakers on sites such as DFW Flight Club on Facebook. It’s simple: take a photo of some shoes, post it online, list the sale price, or list some shoes that you would be willing to trade for, wait for people to contact you, and then meet at a pre-arranged place and make the deal. Perez still deals in shoes online but not nearly as often as before. Since the Dorries deal went sour, Perez has been hesitant to trade with strangers. He accompanied a friend on a sneaker trade not long ago, and the young man they were meeting pulled a gun on them (but then ran away without taking any shoes, for some reason). With sneakers bringing big money, it is natural that thieves and con artists would take notice. Fake Yeezys, or Feezys, are often exposed by poor stitching. Photo by Jeff Prince. Navarro is a 21-year-old retail associate at Sneaker Villa, a shoe store in South Fort Worth. He has seen the rise of counterfeit sneakers on the aftermarket. Some companies make knockoffs of classic shoes and market them as knockoffs. Some crooks try to sell knockoffs as original, or they sell counterfeit shoes made to look identical to the originals. The North Texas sneaker scene has been growing for years, although most of the big shoe stores and events such as Sneaker Con are located in Dallas. The traveling Sneaker Con, billed as the largest premier sneaker show on Earth, made its first stop in these parts in July in Dallas. Throngs of mostly boys and young men flocked to the show. Celebrities other than athletes, such as Drake and West, are cashing in on the craze. Shoes limited in production become highly sought after and can be sold for double the retail price or more. “The more limited, the better,” Navarro said. SportsOneSource, a business that tracks industry news, market research, and retail sales data in the sports and outdoor industries, estimates that the global sneaker market has jumped 40 percent since 2004 to about $55 billion a year. NPD, a domestic market research group, estimates the United States sneaker market grew 8 percent in 2015 to about $17 billion. The aftermarket is growing, too. Earlier this year, Forbes magazine published an article under the headline, “Sneaker Culture Fuels $1 Billion Secondary Market.” To put that amount in perspective, the market is about the same size, financially, as e-sports gaming and the Colorado pot industries. Forbes credited “millennial demand” with fueling the ever-increasing amounts of money being spent on sports shoes. Navarro doubts that will happen with sneakers. For one, people can wear sneakers, whereas baseball cards were just pieces of paper with no real purpose. Perez enjoys working at his mother’s restaurant, but he hopes to open his own shoe store in Fort Worth one day, selling “nothing but exclusive shoes, limited shoes, higher priced stuff,” he said. He will encourage enthusiasts to come to his store to make trades with him and with one another. He wants to establish a safe and friendly place for swapping and for verifying the authenticity of shoes. If such a place existed already, he said, he might not have wound up in jail. After meeting online, Perez and Dorries met in person several times earlier this year to trade sneakers, the first time at the Northeast Mall parking lot. Perez was a few years older than Dorries, but they hit if off. Another time, they swapped some speakers at the apartment complex where Perez lived with his fiancée. 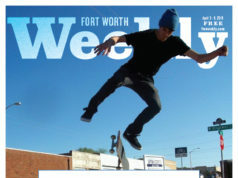 On March 27, Perez and Dorries arranged to meet at a Taco Bell parking lot in North Fort Worth. After Perez traded the four pairs of Air Jordans for the Yeezys, he got seller’s remorse for one pair of the Jordans. Dorries agreed to sell him back one pair of Jordans, and the two met again to make the deal. Once Perez returned home, however, he received a message from an online friend who said Dorries was online claiming to have traded fake Yeezys for genuine Air Jordans. Perez said he called Dorries, expressed his concerns, and asked to meet yet again at the Taco Bell to return the Yeezys for the remaining three pairs of Air Jordans. Dorries agreed to meet but failed to show up at the designated time, Perez said. About that time, one of Perez’s friends called to say that Dorries was online trying to make a quick deal to move the three remaining pair of Air Jordans. Dorries was offering to trade them and cash in exchange for a genuine pair of Yeezys. “He was trying to get a real pair of Yeezys for my three pair of Jordans,” Perez said. Perez’s friend just happened to own a genuine pair of Yeezys. Perez’s friend sent a photo of the Yeezys to Dorries, who agreed to make a swap. They agreed to meet at the Taco Bell. But Perez showed up instead. He demanded that Dorries return the three pairs of Jordans. 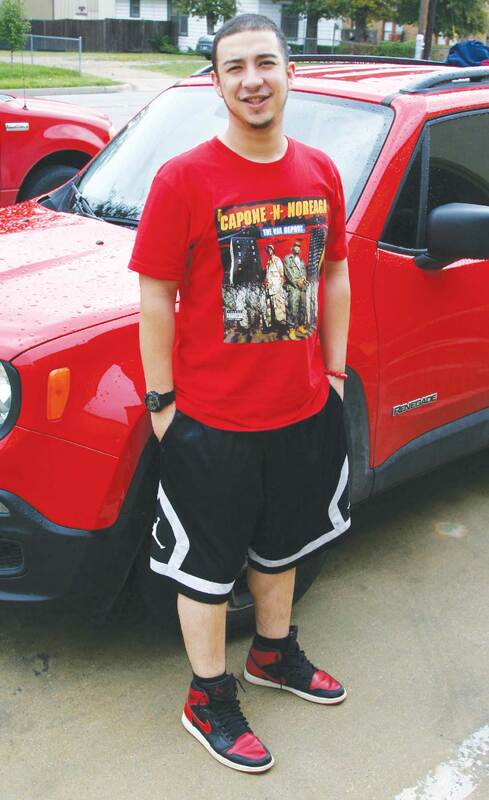 Dorries’ car was in the parking lot, and the teen was standing outside of his vehicle when Perez pulled up. Perez said he parked behind Dorries’ car to block his escape. Neither Dorries nor Perez is a large man. Perez stands about 5 feet 9 inches and weighs about 160 pounds. He is stockier than Dorries, who appears slight of build based on photos of him found on social media. At first, Perez recalled, Dorries said he had only one pair of Perez’s sneakers, but Perez didn’t believe him. He knew Dorries was there to trade away the three pairs of Air Jordans, and Perez told him to open his trunk. The other two pairs of Air Jordans were there. Perez said Dorries handed him the shoes without speaking. Dorries, according to the police arrest warrant affidavit, said that Perez “came speeding through the parking lot and slid to a stop” behind Dorries’ car. Dorries also said he “had no idea” why Perez would take three pairs of sneakers from him but that Perez had intimidated him and caused him to fear for his safety. The arrest warrant affidavit describes how the case was assigned to police Detective D. P. Jwanowski on March 30. The detective called Dorries that day and asked him what had happened. The theft report was upgraded to a felony robbery because of the reported threat of violence. Jwanowski issued the felony robbery warrant on Perez on April 5. The detective did not agree to a face-to-face interview with me but answered questions via email. Jwanowski said he did not try to contact Perez before issuing the felony warrant against him. The detective also said he did not try to obtain Perez’s side of the story until after the arrest. I asked if it is standard procedure to talk to both parties in a disagreement before making an arrest. “Sometimes, when it is necessary to establish certain details of an incident, or if there is a lack of evidence to corroborate the initial complaint,” he said. In some cases, police don’t try to contact the suspect, “especially in circumstances where an investigator wants to preserve potential evidence,” Jwanowski said, indicating that he was worried that Perez might hide or get rid of the shoes he had allegedly stolen from Dorries. In the Dorries-Perez case, there was “enough evidence for a judge to sign the warrants and an assistant district attorney to accept the case,” the detective said. The fact that a grand jury refused to indict Perez on any charges does not indicate that the investigation was flawed, Jwanowski said. And police have no plans on investigating Dorries for filing a false police report or allegedly trading counterfeit shoes “unless new evidence appears,” the detective said. Jwanowski said race played no role in the arrest of Perez and that police handled the investigation properly. Mary said she contacted Jwanowski and his supervisor, Ramirez, to explain her son’s side of the story. She sent them screenshots of Dorries commenting on a private online sneaker-trading site. In one exchange, a person with the user name “Davis” admitted to trading fake shoes. “Oh U trippin,” came the response from another user. Mary called the detective shortly after her son’s arrest but became frustrated by what she perceived as Jwanowski’s lack of interest in hearing any side of the story except Dorries’. Jwankowski, she said, “didn’t even know that we had copied everything” that Dorries had allegedly written online about the sneaker exchange. Mary complained to Ramirez about Jwanowski’s investigation. But Ramirez, she said, seemed just as convinced as Jwanowski that Perez should be prosecuted. Ramirez “told me they have a strong case,” Mary said. The Perezes hired Fort Worth attorney John Brender, who called Jwanowski. Brender wanted to provide the detective with Facebook screenshots and other evidence that the attorney figured would prompt the detective to drop the case. A sneaker expert from Los Angeles, Calif., provided a written statement that the Yeezys in question were fakes. I asked Jwanowski about that conversation. The detective said Brender was offering evidence after the case had been filed already with the district attorney. “Any information at that point should have been followed up with the DA offices,” Jwanowski said. Brender believes it was Jwanowski’s responsibility as investigating detective to take action. A magistrate issued the arrest warrant that day. Perez: “I unbuckled my seatbelt, and they started cussing and yelling at me.” Photo by Jeff Prince. Perez recalled leaving his apartment the next morning with his girlfriend and seeing two police cars parked near an entrance gate to the complex. Perez, sitting in the passenger seat while his girlfriend drove, noticed that both cars began following them and quickly turned on their emergency lights. Perez said his girlfriend turned into the parking lot of a nearby senior center. Several more police cars with their lights on whipped into the parking lot, surrounding Perez’s car on all sides, Perez recalled. Some police officers, Perez added, had their weapons drawn and pointed. Perez’s fiancé was panicking. Perez said police told his fiancé to get out of the car, get down on her knees, lift up her shirt, and then put her hands on her head. An officer handcuffed her and told her to lie on her stomach, Perez recalled. They repeated the process with Perez. I asked Jwanowski why so many police officers would be involved in arresting Perez, who recalled seeing a half-dozen patrol cars and several police officers with their guns drawn. “There were as many officers as needed to safely surveil [sic] a target location, conduct a felony stop of a wanted felon, and execute a search warrant,” Jwanowski said. It is “standard departmental procedure” for officers to draw their weapons when conducting a felony stop, he said. Perez said he tried to tell his side of the story to police but was told to stay quiet. The attorney fees have been high, but Perez has been able to pay them so far. He considers himself lucky. Brender has seen it before. The arrest upset Perez’s fiancée. She ended their relationship after eight years. The arrest warrant affidavit described how Jwanowski went to the apartment complex where Perez lived with his girlfriend a couple of days after the arrest and spoke to office workers for information on Perez. Jwanowski’s inquiry prompted the apartment manager to kick out Perez and his girlfriend shortly after his arrest, Perez believes. Perez is now living with his mother and saving money to make a down payment on a house or an apartment in the coming months. On October 18, Perez and his mother met with Brender at his law office to discuss what they needed to do to file a police report against Dorries. The next day, mother and son drove to the downtown police station to file the report. Perez carried an official, signed, and notarized affidavit giving his side of the story. In it, Perez said he approached Dorries at Taco Bell to get his shoes back. Dorries apologized, returned the shoes, and both men left. “That was the end of that encounter,” Perez said. Brender figured the affidavit would force police to take Perez seriously as the young man tried to file at police report against Dorries for fraud and for making a false report. For details on filing the police report, Mary said she and Perez approached a police officer working the information window at the downtown station. The cop –– whom Mary claims was distracted by his cellphone –– said they needed to call a non-emergency number to make a report. Mary pulled out her phone, called the number, and told her story to a police officer. That officer told her to call the detective who worked the case. Mary had met Police Chief Joel Fitzgerald at a neighborhood event once before, and he had given community leaders his cellphone number. Mary texted the chief in mid-November and asked to discuss her son’s arrest. He texted back saying he would have someone call her. An hour later, a lieutenant called Mary, and they discussed the case. The lieutenant told Mary that her son had lied as well. At the time he was being arrested, Perez had told Jwanowski that he had given away the Yeezys and no longer owned them. In truth, the Yeezys were in a backpack in the car. Perez said he lied to police because they were arresting him at gunpoint, cursing at him, and treating him as if he were guilty before they had ever tried to get his side of the story. Perez didn’t trust the detective. “At that point, I thought the shoes were my only piece of evidence” proving that Dorries had cheated him, Perez said. Later, Perez handed over the Yeezys to his lawyer. Mary thought for days about what to do next but didn’t come up with much. “I’m disappointed in the whole system,” she said. Only idiots would pay that kind of money for sneakers, Jordans or otherwise. Learn to put your money to good use, not waste it on shoes young dopes. Pigs are going to be Pigs, real cops behave like real cops. They are not all the same, but it clearly is evident that America has a surplus of Pigs. Did you read where Trump is President of the United States of America? America has a surplus of folks who do not vote for half-witted baboons but many, many Repugs do that and there you go! Aren’t these snot-ragged heros precious? I do not accuse the square, self-satisfied losers who truly support the USA of being seen by the entire universe as pure mullets, however….wait…consider…THEY REALLY ARE! The whole bunch of the fools are what they are…..what else can they be? Only self-satisfied, deviate, burned out Tea Baggers or hammer-heads would condemn young men for working for the things they desire or require. My bird-dog Roxy is both smarter, and I expect smells better than you Bumblelum, snot-rag. Just another example in a long line of the corrupt and unjust policing of America. There are many of us who carry the stigma of a felony only because we could not afford PROPER legal defense. I’m just glad that this is being reported and scrutinized…keep it up! Nothing new to see here…….Pigs are going to be Pigs,,what else can they be?